Please keep in mind that DMP’s existing 1100 Series Wireless is the most secure wireless in our industry, leveraging military standard, 900 MHz frequency-hopping spread-spectrum supervised communication to attain UL listings for commercial fire and burglary. The new wireless encryption is for customers who want to add an even more hardened layer of security. Now you can have the best of both worlds, industry-standard 128-bit AES encryption over the air, and frequency-hopping spread-spectrum. For added security, DMP 1100 Series encrypted devices allow you to enter your own passphrase for unique key generation, providing full encryption end to end. 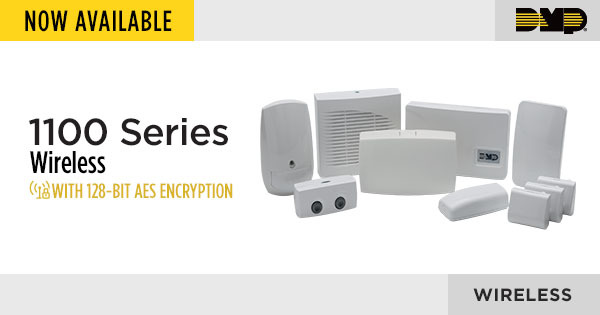 These new encryption model numbers are offered separately from existing 1100 Series devices. For the highest level of encryption, it is recommended that all devices on the system be E models, although each of the new products are fully backward compatible with systems that do not support encryption, so they can be added to existing systems or operate as a stand-alone system. To enable encryption with E models, version 183 or higher is required for XT and XR Series panels. In the coming weeks, please watch for additional releases in this exciting line of new DMP products. For additional information about this week’s product releases, please review the links below. If you have any questions, please contact DMP Inside Sales at 877-757-4367 or at InsideSales@dmp.com.